Ban Gioc-Detian Falls are located in Daxin County on the Chinese side and on the Vietnamese side, Trung Khanh County. 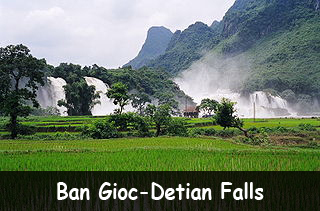 Ban Gioc is a Vietnamese name and Detian Falls is a Chinese name. It is the largest waterfall in Asia and the fourth largest in the entire world. It is more than 656 feet in width and 99 feet in depth. It is surrounded by Karst peaks of Daxin County. The water falls down a three-tiered cliff. These rocks and trees divide it into three different falls. It is located on Quay Son River. Below the fall, there is a deep pool which is more than 656 feet in width and 99 feet in depth. Tourists can swim in this pool on the Vietnamese side but nowhere near the main waterfall or in the river. This natural wonder is shared by two countries: China and Vietnam. Ban Gioc-Detian Falls have a gorgeous backdrop with lush vegetation and colorful flowers. The variation in water volume of the waterfall between dry and rainy season is significant. During the summer, two parts of the waterfall join together and make a larger waterfall. There is Tongling Gorge near these falls which can be accessed only through a cavern from an adjoining gorge. The water rushes down all year long although the flow gets a bit slow during winters as compared to summers. To visit this region, tourists require a police permit which can be purchased at the police station near the waterfall itself. Declan, Tobin. " Facts for Kids about Ban Gioc–Detian Falls ." Easy Science for Kids, Apr 2019. Web. 26 Apr 2019. < https://easyscienceforkids.com/ban-gioc-detian-falls/ >.